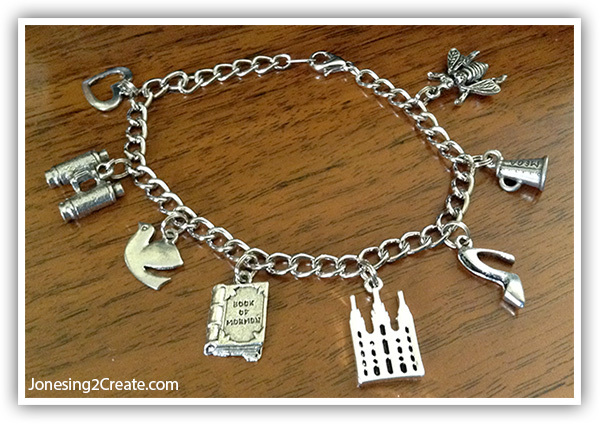 The charm bracelet is easy to mail and can be used as a visual aid while teaching or to distract kids during lessons. Based on the talk “Becoming a Preach My Gospel Missionary” by Elder David A. Bednar. This is for the bracelet shown above. If you would like to add the initials of the mission, the missionary's initials, a birthstone, or other bead dangles see below. Temporarily out of stock. Bracelets will be ready to ship by April 30th. Sorry for the inconvenience. Give your bracelet a personal touch! If you are ordering more than one bracelet, be sure to explain which extras belong with which bracelet. Visit my customization page to see a full list of my dangles, how they are added, and instructions on how to make special requests. 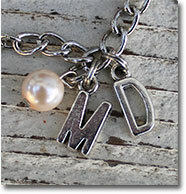 Note: Unlike the other charms on my site, which are manufactured in the US, the letter charms are made in China. According to the manufacturer they are a zinc alloy metal, they do not contain lead, and they meet US standards. Would you like to include gift wrapping? If you will be mailing your bracelet directly to somebody else, I can gift wrap it for you for only $4! If you would like to send this directly to your missionary and she is serving internationally, contact me at info@jonesing2create.com to see if we can figure out a good way to do this. Included with your purchase is a professionally printed card explaining the meaning of the different charms. © 2013-2018 Jonesing2Create. All rights reserved.